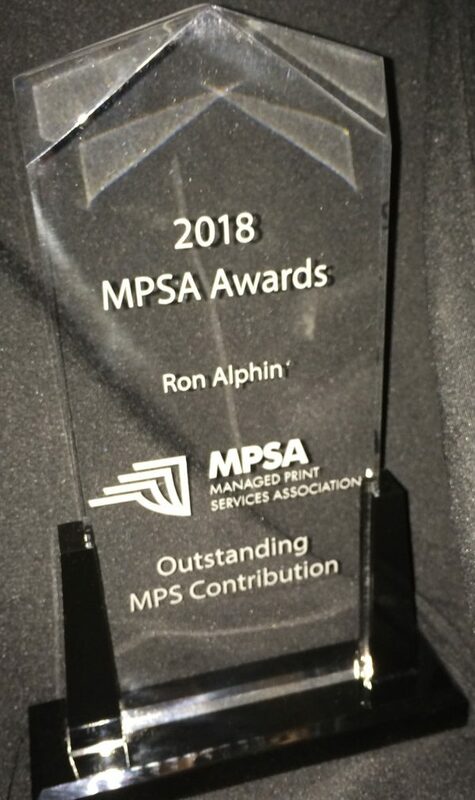 CHESTERFIELD (ST. LOUIS), MO – May 21, 2018 — Today ABM Federal announced that Ron Alphin, Vice President of Sales Operations, was awarded the Managed Print Services Association 2018 Global MPSA MPS Leadership Award for “Outstanding MPS Contribution by an Individual” at the 2018 ITEX Show in Las Vegas, Nevada. MPSA Executive Committee member and Vice President, Tawnya Stone, emceed the ceremony held on Wednesday, May 16th at the MGM Grand Conference Hall. “We are proud of Ron, for his innovative ideas and contributions to both ABM Federal and the managed print services community,” said Steve Nuelle, President of ABM Federal. The MPSA Awards were established in 2010 to honor those companies that have excelled in various areas related to managed print. Winners serve as shining examples to the community regarding their commitment and expertise in managed print services (MPS). The last Global MPSA MPS Leadership Awards were held in 2016 at CompTIA’s Channel Con event. ABM Federal has specialized in providing innovative technology product and service solutions to the federal government across the U.S. and worldwide since 1978. ABM Federal is a Small Business with “Best In Class” (BIC) contract vehicles and an excellent past-performance record. Our experience, agility, dedicated contract teams, and network of solutions partners help customers simplify IT. The Managed Print Services Association (MPSA) is an independent, not-for-profit organization that serves the MPS industry. Its focus is on the development of standards, education, and industry guidelines that unite the different segments of the industry and bring value to all those participating. For more information about benefits and memberships, visit http://yourmpsa.org/Membership or contact us at info@yourmpsa.org.